Whats up everybody, hope you are doing well. Welcome back to my lifestyle blog, where I talk about all the things dominating the time in my life. Since I got laid off I have been playing a lot more video games, and after buying Humble Bundle last month I had a lot of games to play. I got over 40 games in this package but I have been playing one, Stardew Valley, for almost 40 hour now. This game is incredible. 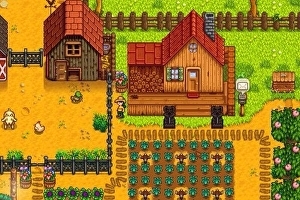 For those of you who have not watched any video game videos in the past 16 months, Stardew Valley is a farming game made as a spiritual successor to the Harvest Moon series. The games has you play a hard working office worker who has grown tired of the corporate environment and moves to the farm left to them by your grandfather. When you arrive with your hand me down tools, a small lump of coins and wide eyes you start to breathe life into the old farm, and can plant crops and trees, build buildings and even craft machines for your goods. The game has five core elements-fishing, farming, foraging, mining, and combat. You can focus on one of all of these skills, as they are all important to create the ultimate farm. You can toil the soil and plant seeds, then forage for berries before ending the day fishing off you dock, and go into the mine the next day to find some rare gemstones. If you like a relaxing gameplay experience, make sure to check out Stardew Valley. It has a small amount of combat in it, but if you focus on making lots of money you will hardly ever have to engage in combat with an enemy. Oh, and did I mention the ten eligible bachelors and bachelorettes to make your farm house a farm home? Check this game out on your respective store, and enjoy! See you next week!